The Saudi King signs his kingdom's death warrant. We often bemoan how modern liberalism and politically correct shibboleths have destroyed the cultural strength of the West and made us vulnerable to the rising tide of Islamofascist barbarism. A shaggy hippie waving a "Make Love, Not War" placard is no match for a turbaned, mad-eyed Muslim waving a scimitar in one hand and grasping a detonator in the other, unless their foul and unwashed bodies cause each other to pass out from the stench. Saudi Arabia's king announced on Sunday women would be given the right to vote and stand in elections, a bold shift in the ultra-conservative absolute monarchy as pressure for social and democratic reform sweeps the Middle East. Assuming that His Majesty isn't just blowing smoke or exemplifying taqqiya, the upcoming changes to his sorry Kingdom will be more profound than he can possibly imagine. The cultures of America and England today are, let us say, just a bit different than they were before women sang and danced their way to the vote. They were even more profoundly different from the Islamic world beforehand. It didn't take the consciousness-raising of the legendary Ms. Pankhurst or Susan B. Anthony to persuade even the most chauvinistic Western man that locking schoolgirls in a burning building until they could properly clothe themselves or be immolated past the point of any potential sexual excitement on being viewed, is Not Cool. As Scarlett O'Hara's real-life exemplar illustrates, Western women weren't legally barred from owning property or driving their own vehicles, much less leaving the house except when under the authority of a male relative. The idea that women should be whipped for the crime of being raped would have horrified American men in 1811 just as much as today. Yet in Saudi Arabia, that's not just tradition and the law, it's their religious duty. Our elites apparently see nothing particularly wrong with that - after all, are not all religions equally valid? No, if Saudi women do indeed receive a free, fair, and private vote and the representatives they elect have real power, Saudi Arabia will shortly become unimaginable in the most spectacularly profound way. Insofar as this change requires men to treat women as human beings, and in doing so undermines the strict Koranic injunctions otherwise, it's fantastic for everyone. Unfortunately, history shows a definite problem with giving women the vote: They end up using it stupidly. Or put another way, once women get used to voting their own minds rather than as they're ordered by the male relatives they previously felt a need to defer to, they wind up voting for leftist statists. For the past thirty years of American Presidential elections, the smallest gender gap was 4 points in favor of the Democrat; the largest, for Bill Clinton's re-election, was a whopping 11 points. If only men were permitted to vote, Bob Dole would have been President and innocent cigars would still be safe from Monica Lewinsky jokes. Other nations' experiences point the same way. The Left has long sung the praises of the perceptive and caring woman voter, but does it really speak well of women's political judgment that their choices have voted us, England, and the rest of Europe into bankruptcy? The Saudi royal family is one of the wealthiest on earth, but their wealth mostly comes from oil under the ground. In a kingdom, that and everything else belongs to the king, but the more a nation becomes democratic the more the people get the feeling that national mineral wealth belongs to The People and not one guy in a robe. Can you spell "income tax," Your Majesty? Hey, the British royals have to pay theirs. Over the century or so that the average woman has had access to direct political power, one thing appears perfectly clear: Women do, in fact, like to be taken care of by Somebody Else. They just use their vote to ensure that it's Big Brother doing it with money confiscated from the successful, rather than their own husbands by the sweat of their brows. The costs of this "improvement" can be measured in women forced to go to work, broken homes, abandoned and fatherless children, and the cultural malaise we see on every side. Don't even get us started on the modern "nanny-state" which treats us all like children and which would imprison everyone in a fine mesh of regulation and government control. The West was not won with a pen, by bureaucrats, or, to be perfectly frank, by the ladies; with today's liberal pettifoggery, the West couldn't be won by anyone at all. It's a fact that Saudi Arabia needs a more humane government and society, though successfully accomplishing this would mean becoming neither Saudi nor Arabian anymore. It's also a fact that modern Western society has gone ludicrously overboard the other way. About the only thing you can say for rule by women is that, generally speaking, they start fewer wars. That is not to be sneezed at. We'd be all in favor of Germany having been run by Eva Braun rather than by her husband. Alas, there are times when tough love is required. There have been strong and effective female leaders, and will be again. 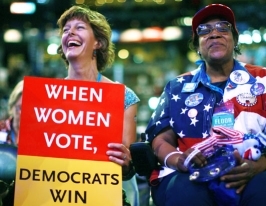 When it comes to more widespread political power, though, empowering women voters is collectively a bad move. It's hard not to notice that all major powers which enacted women's suffrage have subsequently gone downhill both economically and politically. In keeping with Napoleon's legendary advice, therefore, we say to Saudi Arabia and its King: Congratulations! Now please convince the rest of the Muslim world to do likewise. Simply stated, boys and girls are different. They look at the world through different lenses on many subjects. In our culture, or what is left of it, the buy courts the girl. When he courts her he buys the gas, the car, the dinner, the movie tickets, etc. The girl expects as a result that things will be given to her, it is a natural reaction, if things were reversed the boy would expect the same thing. Human nature always will take something for nothing. When the girl starts to vote why should she not want someone else to take care of her? The government is a natural, after all, it has plenty of money. The greater question is not that should women be allowed to vote but should anyone be allowed to vote that does not own property or pay taxes? To singularly blame this on women is a narrow view of a much larger problem. @bassboat - there's no question of blaming women for wanting to be cared for, that'd be like blaming them for getting pregnant from time to time. It's a biological fact that in an agricultural society, a woman can't survive the last 3 months of pregnancy and the year of nursing afterward AND farm at the same time - she needs help. She needs help from other women when giving birth, midwifery is probably realy the oldest profession in the sense of requiring skills and relying on repeat customers. Having given birth, a new mother needs advice from other mothers how to treat this sneeze or that cough - the more help she gets from other women, the more kids she's able to raise. The most important help is from a man, of course, because men are the strength that makes food in muscle-powered agriculture. Women were selected over the years to be able to persuade other people to help them. The more help they get, the more kids they raised. Welfare women who get more money for each kid have bigger families than women whose incomes don't go up just because they gave birth. Women have always wanted to be cared for because if they didn't, they didn't reproduce. Men are willing to take care of women, if they didn't they didn't reproduce. Some men could use the "love 'em and leave 'em" approach, but "love 'em and keep 'em" works better for most men over time. As you said, boys and girls are different. Women voted for welfare so women could be cared for without the hassle of persuading a man to hang around and pay the bills. It worked - welfare mothers have bigger families - but without dad to slap 'em around once they get bigger than mom, boys run amok and wind up in jail. This does't limit reporductive success becuase they generally don't kill each otehr enough to make up for the bigger welfare families, but it's inconvenient for the rest of us. Our inner cities are turning into barbaric wastelands. Women gave themsleves the right to receive public support, but it's ended up reproductively subisidizing nonworking men who don't want to grow up. A man needn't take care of his woman or her kids - taxpayers do that now. LT: To sum it all up, when the government gets involved.............................KaBoom!! !